The new Governor from Smith & Wesson is designed to be the ultimate multi-purpose multi-caliber defensive handgun. Smith doesn't say that in its advertising, but looking at this new revolver I think it's safe to say that's what the company is thinking. The Governor isn't the first modern revolver chambered for the .410 shotshell, but two things make it unique. First, in addition to holding six rounds of .410 2.5-inch shotshell or .45 Colt, the cylinder is relieved to take moon clips, so the Governor can fire .45 ACPs. Second, to accommodate 2.5-inch shotshells, the cylinder of a revolver has to be noticeably longer than usual, and this can result in quite a front-heavy package. The Governor starts with a scandium alloy frame, which reduces the total overall weight to 29.6 ounces. While it is not small (8.5 inches overall length), it is more than light enough to be carried, with a weight closer to a Glock than a 1911. That is not bad at all for a revolver this size, and it did not seem especially front-heavy when I first picked one up. The six-chamber cylinder is stainless steel with a black non-glare PVD coating, and the Governor is equipped with finger-groove black rubber Hogue Bantam grips. There's also a model offered with Crimson Trace Lasergrips. handgun. Some people may argue for an adjustable rear sight, so the pistol can be zeroed for the different calibers it can chamber, but I disagree. I consider the Governor a .410 revolver that can also handle pistol calibers, not the other way around, and it is designed for close-range defensive tasks, not target shooting. There is nothing simpler or stronger than a fixed rear sight milled into the frame, and it will not catch on clothing if you elect to carry it—which is now much more of an option because of the reduced weight. most ammunition manufacturers are making modern defensive ammunition for the .45 Colt; it's not just a cowboy caliber anymore. So why bother to chamber the Governor in a third caliber? Many people will like the convenience of owning a revolver that chambers the same ammo as their autoloader. If you own more than one handgun, chances are you own one chambered in .45 ACP. As far as convenience goes, unloading spent cases from a revolver can't get simpler than when you're using full moon clips, as they fall out in one piece. Smith & Wesson smartly includes two with each Governor. Moon clips work like speedloaders, and spares don't take up much room in a pocket. Also, while there are numerous loads available for the .45 Colt, they pale in comparison to the diverse cornucopia found for the .45 ACP. The .45 ACP is additionally available in a number of +P offerings. In addition to the two six-round full moon clips S&W provides with each gun, you get three two-round moon clips, so you theoretically could fill your cylinder with two rounds each of .45 ACP, .45 Colt and .410. The Governor's sights seemed regulated for projectiles traveling around 850 fps. Anything slower than that and the rounds were hitting high, and anything faster and they were hitting low. The slow Hornady 225-grain .45 Colt Cowboy load (just over 700 fps) hit about three inches high at 25 yards, whereas their fast 185-grain Critical Defense loading in that same caliber (1,100 fps) hit six inches low. In testing .410 loads, at five yards the Remington pellets hit the target in a six-inch group and at 10 yards were doing wild 12- to 18-inch patterns. The Remington load was hitting centered at that distance, however. The PDX1 load, while keeping tight groups (Defense Discs in sub-four-inch groups at 10 yards, with the BBs keeping a 12-inch pattern) hit a good five inches high at 10 yards. Except for a few BBs it was completely off the paper—high—at 25 yards. If you look at the basic ballistics of the .410 versus the .45 Colt or .45 ACP, standard .410 loads have nearly the same payload/velocity as .41 Magnums. Some defensive loads (like the Winchester PDX1) created specifically for .410 revolvers have reduced velocities, but they still recoil more than .45 Colt or .45 ACPs when fired in the Governor. Firing the Governor with .410 loads feels like touching off a magnum, and I was grateful for the comfortable rubber grips. However, these are grips designed for concealment as much as comfort and do not cover the back of the frame. At 10 yards, the maximum distance you're likely to be engaging someone defensively inside a home, the Governor with most .410 loads was doing 12-inch groups or better. In other situations, you would really need to consider what you're loading into the Governor. 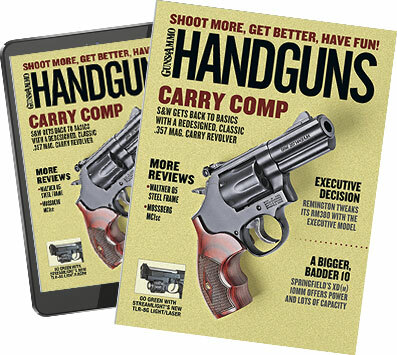 A large, crowded venue is not the ideal place to be carrying a defensive handgun loaded with a cartridge that fires ever-expanding clouds of projectiles, any one of which could kill someone. Personally I think of the Governor as a valuable general purpose bedside table gun when loaded with shotshells. The beauty of this design allows you to load the Governor with birdshot for the field, buckshot for the bedside table, and yet load it with .45s when it comes time to head out of the house running errands. There are inherent dangers in this, so you need to be aware of just what ammunition is loaded into the revolver and where it hits with every type of ammo you might load into it. Caliber: .45 ACP/.45 Colt/.410 2.5 in. Avg. with .45 ACP—3.6 in. Avg. with .45 Colt—3.0 in.